Thursday, August 12 1908 -- Hot-tempered local librarian Charles Lummis has reviewed the Century Dictionary, a monstrous multi-volume American dictionary, and found it wanting, primarily in relation to many words associated with California, Latin American culture, and the West in general. Lummis originally merely made some less than favorable remarks about the dictionary at an NEA convention, and two of the compilers, Benjamin Smith and Brander Matthews, made the mistake of accepting his remarks with some disdain. 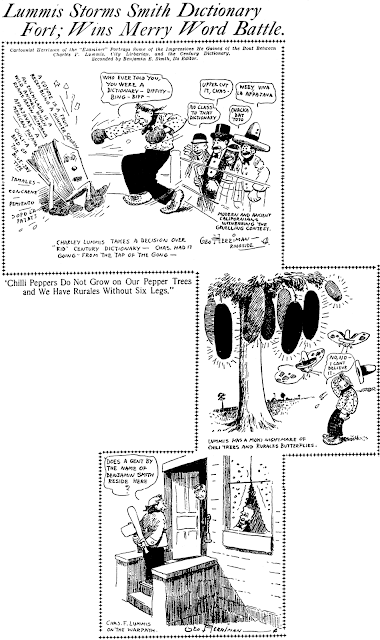 Lummis then started raising some very public hell about an entry about 'chili pepper trees', an entry claiming the Salton Sea had disappeared, less than complete definitions for rurales, chilacayote, the etymology of caballero, and more of the like. I don't know if anything ever came of Lummis' objections, other than giving Herriman the raw material for a fun cartoon. However, no new editions were produced of the Century, so maybe Lummis did have his revenge. I apologize for the ever-changing pricing and availability of the book on Amazon. That's beyond my and the publisher's control. However, keep in mind that my publisher is offering that 40% off deal, so if Amazon can't get their act together, it's their loss. On the other hand, I'd like to encourage anyone who has purchased the book, from Amazon or otherwise, to please post reviews on Amazon. In this strange modern world, your book isn't counted as a success until it is well-reviewed there! I have been asked about reader submitted revisions and corrections. As I state in the book, I am always enthusiastic to hear from anyone who has additional or correcting information.You may contact me by posting a comment on the blog, or sending me email directly (to strippersguide@gmail.com). One thing to keep in mind -- the data for the book was submitted to the publisher three years ago, so if it happened since then, it isn't in the book, but not because I missed it. Barring massive indifference, my hope is that new editions of the book will be issued eventually, so submitting your data is worthwhile; eventually it should be made public. I've already heard from some folks with some great additions and corrections. Of course, during the past three years my research has certainly not been at a standstill either, and I have loads of new information, too. Although it may appear as if I took a vacation from the blog, I have by no means been vacationing. What I've been up to these past weeks is trying to build a new Stripper's Guide blogsite, one where I can implement all the neat features I've been dreaming about for years. On my break from blogging here, I've been learning Wordpress, which is a more high-end blog-builder, and trying to set up the new website with it. Unfortunately all has come to naught. I've been with Earthlink as my web host for years, and rarely had anything but praise for them. But trying to set up a Wordpress site with them turned out to be useful only for seeing how high my blood pressure could rise. They say they support Wordpress, but only in the sense that they will let you install the basics of it -- if you actually want to use it as more than a toy, forget it. The amount of time they made me waste, troubleshooting mysterious problems and trying to get a straight answer out of their support staff, verges on the criminal. So now I'm back to square one, and shopping around for a good web host that supports Wordpress 100%. If anyone has recommendations, I'd love to hear from you. Until I get all that straightened out, and get back on the horse of website building, I'm back to blogging here. I'm going to need a little time to get back up to speed, so first new post will come this Saturday. I've had fantastic experience with Dreamhost with the full-install version of Wordpress... I've probably used it for at least ten blogs at this point. They have a "one-click install" that makes it extremely easy to implement. Also, they have the best tech support I've ever dealt with... and they offer tech support for Wordpress even though it is not their product. I can't recommend them highly enough. Good luck with your transition to Wordpress... it is a wonderful tool. I use Fatcow for both of my sites. Very reasonable pricing with excellent tech support. Let me second Steven with Dreamhost. I use Wordpress on it and it's magnificent. I've heard good things about Dreamhost around the web, but it means a lot more to me from known 'real people' like you guys. Two questions: do you pop for the more expensive VPS, or just use the shared? Also, do you pay extra for unique IP or not? Laughing Squid is great for Wordpress blogs. It's pretty much their specialty. Actually I meant to ask whether you Dreamhosters think it is important to get a unique IP address with them. I understand it is pretty easy to get blacklisted if you share an IP with some fraudulent website. From what I've heard, a one click installation of wordpress or another CMS will be unstable and inadvisable for a blog with a huge number of entries. I and my co-bloggers have used Totalchoice for many years and they are pretty decent. I would guess wordpress.com would be reliable. I'm not familiar with the unique IP issue you're talking about, Allan. I have not paid for getting a unique IP, and I have not had any issues that I am aware of as a result. That said, it couldn't hurt! Regarding David's comment, my Stwallskull blog has over a thousand posts, and I have had no stability issues with Wordpress. I have also used Wordpress to import blogger blogs twice, both for blogs with over a hundred posts, and it went perfectly with one, about 80% smoothly with the other (the one with less posts, actually). I should also note there are wordpress plugins for backing up your database (among many other useful plugins). I have backups automatically emailed to me daily using the "Wordpress Database Backup" plugin.